Halt the Sea Viper invasion at the South Beacon lighthouse. South Beacon — Disrupt the Maormer invasion of South Beacon. Maormer pirates took the lighthouse at South Beacon and are signalling more pirate ships to come into port. If they're not stopped, they'll have the numbers they need to move on the port of Vulkhel Guard. Rescue Captain Ciranya from the Sea Viper camp. Free the three other captive members of Ciranya's patrol. Collect the materials needed for a potent fire-bomb. Acquire a rune from a Sea Viper to pass through the warded lighthouse entrance. Ascend the lighthouse and burn the beacon. "They … came from nowhere. By boat, maybe. Never been this far inland. Captain Ciranya …." "Maormer pirates. They've taken South Beacon. My captain, my crew. All captured. They took control of the lighthouse. This is bad. 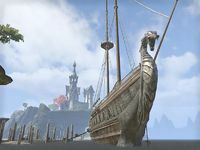 With South Beacon as a staging area they can raid the Summerset Isles at will." "I can make it back to Vulkhel Guard. You have to find Captain Ciranya. She'll know what to do. She's a prisoner at the Maormer camp down the beach. Please … hurry." I'll find her. Tend to those wounds. Captain Ciranya can be found in the sizable Sea Viper encampment. Fight through to a large tent, to where the captain is being held, she will be grateful to see you. "Well met, stranger. As you may have noticed, I'm not at liberty to stand and greet you properly." Why did the Maormer take you captive? "They mean to invade Vulkhel Guard. Their plan is to use the lighthouse at South Beacon to communicate with their fleet. We need to stop them." "You have more important things to attend to? Don't answer, that was rhetorical. Three of my scouts are being held captive. Free them and have them meet me at Skylight Beach. I'll scout the lighthouse and find a way to gain entry." The legionaries are all fairly close by, with Uulion to the north, Norfando to the southwest, and Pandetuile further south. Free each from their bonds after defeating the nearby Sea Vipers. They will be appropriately thankful and head off to nearby Skylight Beach. Once all are free, follow them southwest across the bay to find the whole squad resting and licking their wounds. "Tildur, the lighthouse keeper, was spared. I don't think they considered him a threat. He says the Maormer are using the lighthouse beacon to send messages to their ships. We can't wait for reinforcements. We need to take action, now." "The lighthouse is solid stone, but even stone can burn, with the right mixture of kindlepitch and fire salts. Tildur can tell you where to find the necessary ingredients. Use this glass vial. One well-placed fireflask should be just the trick." "Tildur says the Maormer placed a magical ward on the lighthouse door. I need to figure a way through it. Go, quickly!" "We haven't much time! You'll need fire salts and kindlepitch to destroy the beacon. Talk to Tildur. He'll know where you can find them." "Rid Auridon of that murderous scum, even if you have to burn my lighthouse to the ground." "A mixture of kindlepitch and fire salts burns bright as the sun. Toss it into the heart of the beacon and the stone will melt like butter on a hearthstone." 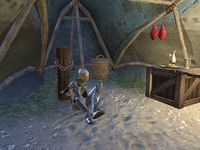 "The Maormer use fire salts to warm their food on long voyages. They should have a supply in the hold of the ship moored in the harbor." Where can I find kindlepitch? "I have stores stashed in a cave on the backside of this island. You'll find a bag of kindlepitch among them. More than enough to reduce the lighthouse to slag." You can collect the ingredients in any order, but the Fire Salts are nearest, on board the Maormer ship, the Briny Shank, to the northwest. It is easy to swim directly from Tildur's location to the dock, avoiding the enemies on the beach. Once on the ship, go belowdecks and proceed through the interior to the far end, where the salts are stored in a chest near the food preparation area. Proceed into the last room to ascend the stairs and exit back out of the ship. Now you can leap off the port-side railing and begin swimming due south towards the lighthouse. Climb up the beach and proceed to circle around the island, fighting through a half-dozen Sea Vipers along the way. Once you make it to the far side of the island, jump down to the sandy area and look for the entrance to a small cave on your left. Inside, find and take half-buried sack of Kindlepitch. Once you have the second ingredient, you will automatically combine them to create the Volatile Fire Mixture, return to Captain Ciranya. "You have the necessary ingredients to make Tildur's fireflask? Excellent. I've been watching the Maormer come and go from the lighthouse, and discovered how they get past the ward on the door." "The Maormer carry a magical rune that dispels the ward long enough to gain entry. Steal a rune from one of their patrols near the lighthouse, use it to dispel the ward, and you're in. You need to hurry! They're nearly ready to signal their fleet." "Simple, until the lighthouse begins to burn. You won't be able to come out the way you went in, and you can't sprout wings and fly away. Take this teleport scroll. It will transport you back to the rendezvous point at Skylight Beach." She will then hand you the Teleport Scroll. From the Skylight Beach, head north to begin ascending a spiral path towards the rocky plateau at the top. There will be many Maormer in your way, who you must keep fighting until one of them happens to drop a Maormer Rune. Once you have acquired it, approach the entrance to the lighthouse, which is blocked off by a magical barrier. Present your rune to dispel the barrier and enter the lighthouse. Maormer Pirate: "Did you see that? The lighthouse beacon exploded!" Maormer Pirate: "I see it. The … tower is on fire!" Maormer Pirate: "How did this happen? What will we do?" "This invasion is over! Without the ability to signal their ships, the Maormer won't be able to navigate the shallows. They'll turn around or find themselves swimming back to Pyandonea. All of Auridon is in your debt. Well done!" "We'll head to Vulkhel Guard and return with reinforcements. By this time tomorrow, South Beacon will be ours again and the invaders will be nothing but a bad memory. We couldn't have done this without your help. You won't be forgotten." With that, you will receive your reward of a hefty amount of Gold and the First Mate's Leathers. I need to break through the Maormer beachhead and find Captain Ciranya. I need to rescue the few remaining survivors of Captain Ciranya's patrol. I rescued the remaining members of Captain Ciranya's patrol. I need to talk to her to figure out what's going at the lighthouse. I need to collect a bottle of kindlepitch from Tildur's stash and some fire salts from the Maormer ship. I need to talk to Captain Ciranya to find out the next step of the plan. The lighthouse is blocked by a magic barrier. I need to get a rune from the Maormer spellcasters to gain access. Now that I possess a Maormer Rune, I need to use it to destroy the barrier blocking me from entering the South Beacon Lighthouse. I must enter the South Beacon lighthouse. I need to go up the lighthouse and destroy the lighthouse beacon to halt the Maormer invasion. Now that I destroyed the lighthouse beacon, I should use the teleport scroll to return to Skylight Beach. Finishes quest I should speak to Captain Ciranya. This page was last modified on 8 April 2019, at 04:58.